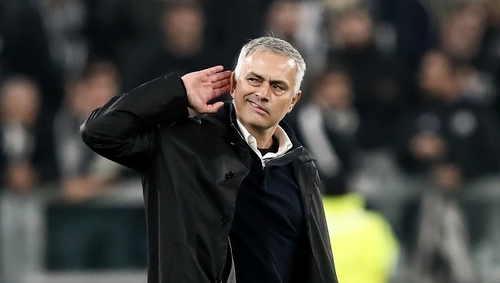 Jose Mourinho lauded his players after securing after a stunning comeback victory that the Manchester United manager milked in front of the Juventus fans. Cristiano Ronaldo's magnificent volley had Juve on course for victory but it was the visitors who would land a stunning blow in a Champions League clash to cherish. Juan Mata's superb free-kick four minutes from time sent the visitors wild, but the best was yet to come as an Ashley Young free-kick was unwittingly bundled in at the back post by Juventus' Alex Sandro to give United a last-gasp win. The 2-1 victory is United's latest memorable win in Turin and boosts their hopes of progressing from Group H to the knockout rounds. "Probably when Manchester United had heroics here (in 2003), Manchester United was the best team," Mourinho said. "And they (Juventus) are a top team for many years now. They bought that player (Ronaldo), they want to win everything, they can win everything and we are a team where many of the players didn't play big matches like this in the Champions League. "So it is a different situation but it is a fantastic victory for us - a victory that is not just about the points we lost at home, it is about the feeling of how well we played. "And I think even if this game doesn't end with a victory, I would have the same feeling that the team played really, really well from the first minute - I repeat - against a super team." "Well, do you remember what they did to me? Well, the sign I made is actually not an offence," Mourinho said. "This is something more... I just wanted to hear them making comments again or not. Yes, before I said I would not do it but then I did (react)." You can see why Mourinho got caught up in things on a night where he praised substitute Marouane Fellaini for making "the team alive again". The imposing midfielder made his presence felt as the winner went in, with victory injecting new life into their Champions League campaign and providing a great lift ahead of Sunday's derby clash at Manchester City. "I think we played this season against Chelsea and Juventus away, the two best teams that we faced this season, and we played very well in both," Mourinho said. "Very well in both. "In here, lucky to win in the last minute. Against Chelsea, unlucky not to win in last minute, but we played very, very well and this is what we want. "We want to play well, we want to go to every stadium and it doesn't matter the team and we play. "Then, if they are better than us, they win. If they have more potential than us, they win. If we make mistakes and pay for the mistakes, we lose. "But I want the feeling that it doesn't matter where we go, we go to compete and I think this is a feeling that also the Manchester United supporters around the world want to have - switch on the television and it doesn't matter where we play, they know we are going to compete. "We will lose matches. Today we could lose, but that feeling of 'we go to play, we go to try to win'." "It's a shame," he said. "The team produced a good performance but were never able to put them to bed. "There's always a risk when you play against the top teams. We give away too many free-kicks in both wide and central areas. "That said, we're still top. We have two games left that we can use to ensure we win the group and go through to the last 16."